In the distant future, when humanity has spread to hundreds of habitable planets in the galaxy, when good little boys and girls live thousands of light years away from the North Pole on Earth, how does Santa Claus deliver their toys on Christmas? 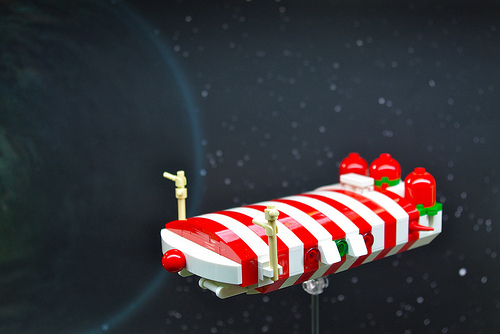 Why, aboard SCSS Rudolph, the jolly old elf’s Candy Cane-class space corvette, of course! The Rudolph features a pair of high-gain subspace comm arrays, a Hawking-Kaku event horizon drive, and a cargo hold that takes advantage of Gallifreyan technology to maximize interior capacity. Build notes: I actually threw this together back in January, during my Chris Foss-inspired microscale phase, when I was trying a variety of color combinations. Red and white looked a little too Christmasy, so I went ahead and added a red nose, a pair of antlers, and some green accents, and then saved it until now. When I start building, I often don’t quite know where a LEGO model is going to end up.